♥.•*¨Author Elizabeth Mueller¨*•.♥: ♥.•*¨Z is for . . .
Michael @ In Time . . .
Lisa Galek @ Read. Write. Repeat. Sixty Is Just The Beginning! Crystal Mary. Boys Need To Be Blessed. Rachael Harrie @ Rach Writes. . .
For the Love of. . . .
Lisa Aldin: Dear Novel. . .
Michelle Julian @ Writing Possibilities. . .
WRITE WILD: On Picture Books. On Writing. On Life. The ramblings & obsessions of a fishermans wife! Today I think. . . This sounds challenging. Im in! Kristine Asselin, Writing. For Real. Everything you didnt want to know about writing. With Flowers In Your Hair. . .
Express Your Faith Magnets and more. Coffee, Teapots and Books. . . Oh My! Things I Think I Know. . .
Pirate Knitting - Free patterns, notes of pirates. Cancer and Baby equals chaos! Walk A Mile Not a writer but loves a challenge! Within the darkness. . .
My Special One. . . . . . .
Dreams of Young Chicana: One Goal at a Time! Charlee Vale - Author, Actor, Artist, Absurd. DungeonBriefs Brief post about role-playing games. Ramonas Disney and more Sketches!! A-Z Blog Challenge- Im In. For the Love of Couponing! Read my books; lose ten pounds! My Mother-In-Law is Still Sitting Between Us. . .
Got Love, Been Married, Where the Hells the Baby? Better late than never. See you tomorrow. jennie of course: My thoughts on life. C is for Creating by These Little Pieces! D is for Decorating By Mazie from TLP!! Congrats to your awesome awardees; 642 wonderful bloggers. Yikes! Is it only 642? I know tons more did it! Gotta fix it! Sorry, guys! Congrats on completing the Challenge and many thanks for the award! Hope we can keep in contact via our blogs - though I'll probably go back to blogging once a week (or maybe twice) from now on. Thanks for the ccomment, congrats yourself on completing the A to Z AND also thanks for this wonderful award. Thank you so much for the award. This is one award that I really feel I've earned. Great meeting you through the A to Z. I've met some lovely bloggers. And good luck with visiting all 1282 of us. Yeah we did it! And thanks for making the award! It's a hoot! Awesome! I still have so many blogs to visit. Hopefully I can get to everyone in May. That award just made me smile. Thank you for such a lovely award. I will put it on my blog for sure. I'm not sure what I have learned. But I do enjoy reading everyone's blog and all their comments to my post. Thanks, Elizabeth. Wow, you even copied the whole list!! I didn't visit as many blogs as I wanted to, but did enjoy it just the same! See you on another round! In Miniature Style II - Minis, pix, projects, fun! Such a cool award idea. Thanks Elizabeth! Thanks so much for the award and congrats on finishing. One day I might ask you how to make awards - it's something I haven't done yet but would like to learn. What a great job and the challenge was so much fun! Thank you for the beautiful award! I am sorry to see the challenge end as I did last year. I love this particular opportunity and always hate to see it go. Hi, Elizabeth! I LOVE the award!!! Best award EVER because of the zebra, of course, and because we completed the A to Z Blogging Challenge!!! Wahoo! That is awesome, Elizabeth! A zebra - perfect. Thanks so much! Thank you, Elizabeth! And congrats to everyone for a job well done! Looking forward to next year! And all the challenges to come in between! Awesome award, Elizabeth! Thank you! I love zebras anyway, but it's a perfect symbol of completing the challenge. Thank you so much for the award! Congratulations on a strong finish. This has been a blast!! I am sooo proud to display this award. Congrads to us all!!!!!!!!!!!! :-) YAY team. Thank you, Elizabeth! Love the award and I do feel a sense of achievement for having completed this Challenge. The pic in the award reminds me of Laura Marcella's blog post for the letter Z. Yep, we're all awesome and determined blogging creatures! We should all take this attitude to our writing, which reminds me, I have a lot of editing and writing to catch up on. :D Thanks again! You're wonderfully creative to think of this! Very nicely designed award! Thanks for the sentiment and I think we should be pleased with having acomplished this month. Now - how about we get on to world hunger! ah, you think I'm kidding but I'm not!! Let's figure it. We have collective power - why not harness it for something that could change things radically. I'll be in touch. In the meantime, let's have a martini and celebrate. You did a terrific job creating the award! Yes we did it! I think you should get an award for making that list!!!!!!!!!! Thank you for the award! How fun. :) WAHOO FOR COMPLETING THE CHALLENGE. Thanks so much, Elizabeth. It's adorable and I'll put it and a link to you on Monday's wrap-up post. Thanks for the award, Elizabeth. Looks like an awesome list to go down! Enjoyed it all, learned a lot! Hi Elizabeth .. thanks so much for the Zebra .. one of my favourite African animals .. always loved seeing them in the bush .. Whoa!! That's some serious linkage love! Thanks for the award, and congrats to you for making it through the alphabet! It was a fun challenge, n'est-ce pas? I'm bookmarking this page, too. I wasn't able to visit all 1200+ participants this month, so I'll use this post to make my rounds. Thank you!! Cheesecake. Pink Floyd. Love Jesus above all else. You rock, you really do! I am astonished that you're spending the time to get around to everybody and present this award. There are so many people in this world who can't even manage to spare a few minutes for a "friend" sometimes...and here you are, putting out all of this effort to encourage and inspire. In more ways than one, this challenge, and the people I've met, have restored my faith in the goodness of humanity. Thank you so much. hugs and warmest wishes, Lisa @ FlashFiction. did all 1282 people really complete the challenge? If so, that must be a record. I LOVE this award! Thanks so much and congrats to you too! What a great award to create - thank you! Thanks so much for this fabulous awards. I shall post it proudly. I am so excited to get my lovely award! how do I post it? nice to be following you now! You are a delight! Thanks, Elizabeth! What a great idea. It's been great fun and I can't even believe how many participated! Outstanding! What a great award! Thanks so much! There were a couple of letters that were difficult, but this was a lot of fun. I'm glad I joined in. Congrats to you for finishing as well! Thanks for the award! It'll take me until the mid of May to fully survive the challenge as I still need to get to the remaining 400 or so blogs that took part in this challenge. Thanks for the awesome badge! I added it to my post with a link back here...so nice of you. Was great to see everyone from last year and all the new faces this year. iZ an aweZome award. thankZ. Awesome award. Thank you very much. Congratulations on completing the A-Z challenge as well. Well done! Thank you, Elizabeth. We worked hard this month and all deserve a pat on the back. I will post the award with pride. Thankz so very much! I will wear my badge with honor! I learned that there are tonz of thingz to blog about...you just have to be creative! No excuzez when ya think there'z nothing to blog about! THANKZ AGAIN! Congrats on surviving the challenge! What a lovely award! Congrats to everyone for hanging in there! What an adorable award! So cute, thanks!!! Zippety do dah! We did it. Congrats to you and thanks for the award. Congratulations to you and everyone else for making it through. Great award! I will link to it on my Monday post. We also have an official A to Z Winners Badge which will be available on Monday. Nice! I like it! Still can't believe there were nearly 1300 people doing this challenge! Thanks for the awesome badge Elizabeth. So sweet. I will proudly display it, with your link, on both my Travel and Writing blog. Thank you and congrats on finishing the challenge with aplomb. Thank you Elizabeth for the award, it will be displayed proudly on my blog. I didn't even realize there were 1282 participants. It's going to take me a while to get them all but that is my next mission. Enjoyed the trip! Thanks for the award, that's very kind of you to do that! And, congrats on making it to the end of the challenge! Y was the hardest for me, Z was the easiest! I am THRILLED with the awesome award for the A-Z challenge and the fact that we MADE it through~!! I thank you EVER so much, Elizabeth~!! And, congratz to you for getting to Z~!! thanks so much for the award Elizabeth - congrats on surviving the A-Z challenge. It was fun (sort of). I LOVE the ZEBRA AWARD! Thanks for dropping by my toy blog and giving me the awards. :) You did great too! You are wonderful for doing this. I'm going to replace the A-Z Challenge button with this one right now. Thank you, Elizabeth! I love all the green over here(my fav color)! O happy day, we made it! Thank you for making this laughing zebra award. WOW we all really did it. 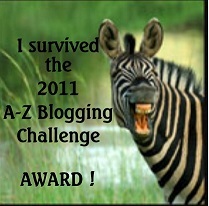 Awesome zebra award, put it right under the challenge badge on my blog. Thanks. Thank you for the award. I'd imitate a Zebra if I knew what sort of noise it made. Hi Elizabeth! I made it further than I did last year, so thank you for the award! How brilliant! We made it!!!!!!!!!!! Wow, congratulations on that list alone! Thanks so much for the award, I haven't really completed the challenge but I think I'll display it anyway, it's too nice not to :-) Maybe I'll make a better job of it next year. We made it! Congratulations on the award and thank you for passing it on. I shall put it in my reflections post on Monday. This is such a nice surprise. I enjoyed every bit of the challenge. The last seven days began to be a chore. I didn't think I could do it. I just didn't want to give up. I haven't done well in any past challenges. So, is truly my first success. I might just try it again. Thank you so much. I love my zebra buddy too. Thanks. Elizabeth - thanks so much for this award, much appreciated! Well done for completing the A-Z challenge AND for compiling that list - that's some feat! Congrats Elizabeth--I'm happily accepting the award. Whew! It's been great! Congratulations Elizabeth! And thank you so much for my award. I'm following and I'll definitely link back to you. How come I only just found you (better late than never)! Huge congrats, Elizabeth, and thank you so much for the award. It's amazing. Fun. So kind of you! Awesome award. I'll definitely post it and link to you! Congrats on finishing the challenge! I think we all deserve a pat on the back. This is amazing and so sweet. I learned the topics that interested me most had the most readers, apart from the Frozen Food one, which still has the most clicks, so I guess food rocks in any sense. Same with my Mozzarella poem, apparently people like discussing food. HOLY COW! Did it take you seventy hours to create that list?! Thanks for creating the award, I had fun with the challenge! Thanks so much for the Award - sorry I was called away by my pony's health. He's still not well so my own blog is in limbo, but just wanted to say thanks again and it was great fun. Thanks, Elizabeth! The award is awesome! I had such a great time with the challenge! I was just directed over here and...Wow! Thanks so much. The award is so awesome. I had a lot of fun with the challenge and have found (and keep finding) some really awesome blogs to follow! Wooooooo! Look at all those people! Congrats on making it through to the end! And thank you for the award! I learned that I am resourceful, respond best under a deadline, and although I will cop-out when necessary (see the Letters G, I, and P ) I can also rise to the occasion and do better and more than expected from time to time. It was fun; I'd do it again; but I need a break! The social aspect was definitely the best part. Thank you so much for this cute award! I have added it with a link back to you in today's post as well as on my "Awards" page. Thank you so much for this award. We did do it, didn't we? This was so much fun...I'll be back next year. Thank you so much! Great blog award. Congrats to all of us! How thoughtful, and creative, your award is. It will add to my blog a sense of whimsy to go with the ditziness. Thank you! Thank you! What an awesome award! I will definitely link and post my thanks on my blog tomorrow (Monday) too! Thanks for the award! It's well deserved by all of us. And I do love zebras. Well done all of you for subjecting yourselves to the 'A to Z Blogging Challenge!' complete with the exclamation mark, for dramatic impact. Really nice to see further awareness of the alphabet! What I've learned is this is crazy, but that I have a lot of stories and ideas and a little push in the right direction really helps me write... Thank you for listing all of the participants and the fun award to paste on our blogs. Thank you. It was fun ... and, WOW!, what a long list! Thanks Elizabeth. I had fun and I love the award. That's a crazy list! Congats to everyone who finished, and thanks for the award! It was a lot of fun! Wow... so many to choose from! I'll have to follow you so I can not only read your stuff but also have this list to go through some others & see what great things I find! Thanks for the award! I sure am glad this challenge is finally over! Thank you for bestowing me with this award. Much appreciated, I had a blast with the challenge! Elisabeth Thank you so much for this awesome award I will display it proudly. I will gladly link up and follow. It has been so much fun! I still have many I need to visit and do intend too. Thank you! It has been a journey. Im so happy to have meet so many. Aw thank you so much for making an award! What a great award. Thanks a million. Bless you for the award!! Thanks and it was fun, the entire blog-fest!! You guys are SO welcome! It was such a fun month, it almost feels like goodbye, but I have you guys here--we'll always be connected! *HUGS* To everyone, enjoy the slower months ahead!!! woman, you're amazing for doing this!! I'm so glad it's over!!! Wow, look at that list! I'm not sure I'm in the position to collect the award, since I phizzled out after 'P'. But, thanks!! Thanks! And, Wow, what a list!! What a cool idea. Thanks for the award. What an amazing amount of work that went into this post. It must have taken you hours to provide the links. I am grateful for the award. Thank you so much, Elizabeth (I like your background, by the way). Thanks so much for the award. I am proud to display it. Aw thank you! And it's so great to have everyone listed here - I still have so many new blogs to visit. And am still trucking with the challenge - on Q so far... will probably finish at the end of May! That is such an awesome badge! I will definitely wear it with pride! Congrats to all who took part! Thank you :) I learned that if I stick with it and post every day, I can attract more readers. Thank you. I'm a new follower and, Yes, I will link back to you with the award. Thanks for the award. The challenge made me think, made me laugh, made me explore. Looking forward to next year. Thanks so much for the Zebra! I feel I've really been on a journey, and I've met so many wonderful people along the way. Many thanks for instigating this. What a great 'badge' for the blog - thank you! I've so enjoyed this challenge; I've definitely discovered blogs that I wouldn't have done otherwise. I can't believe I actually finished the challenge and on time too! It was so much fun! I've met a lot of great people along the way and hope to keep in contact now that the challenge is over. I was #542 to sign up for the challenge. I can't believe how many people signed up after I did! This challenge was a huge success! At the beginning I thought I must be crazy. I went from rarely posting to posting every day. I am so glad I did because it has been very rewarding and I have met so many new and wonderful people. Thank you! Thank You for the award!! I had a lot of fun. Can't believe the award is a zebra. It was my last post because it's my favorite animal. Please stay in touch, I will do the same. Wow, until just now, I didn't realize just how many people participated in this. I feel so isolated in my little Facebook group!! Thank you for your "we survived" award! I appreciate it and have posted it on my blogs. In the words of the inimitable Jason Hawes upon completing a successful ghost hunt, "On to the next!" Wow - thanks! I'm with Yvonne, just above me in the comments. Great award graphic! Thank you! All I can say is Wow! Great award and congrats on finishing the challenge. Congrats on surviving the challenge and thank you so much for the award. Thank you so much for the award!!! It has been a great month... see you next time!!! Hahahahaha!!! It's the funkiest award ever!! What a great work Elizabeth! Thank you very much for the cute award and congratulations on finishing the challenge! It was fun. Thanks for the Zebra! The A-Z challenge was a lot of fun. I'd only started my blog a month & a half before, so it was quite the deep-diving-in. Unbelievable, but we really did it! A-Z Challenge is over! :-) That's amazing ... and also a little sad! *sigh* A big applause to all of us! cute award! it's perfect to end off the challenge. I've met such wonderful people through this and I am thankful for that. It really put me to the challenge when Easter arrived and then being ill towards the end of it but all in all it was fun! thank you for the award and I will proudly display it on my blog! Thank you so very much for this creative award. Yes...we did work hard on the A-Z Challenge but its been very rewarding for me. I've met so many new friends! Thank you again and congratulations on your book! It shows that perseverance pays off. I'm grateful to authors such as yourself who are an inspiration and make reading a desirable pastime for our young readers once again. God Bless. Thank you for the award! Congratulations on completing this year's challenge. So glad I participated and got to know so many great folks. Wow! Not only did you participate, but you're handing out a crazy cute award to all (almost) 1300 participants?!!! D id for Dedication. Thanks so much, I'll post a link back to you as soon as I get a chance! Wow, this is quite a feat! Thank you so much! Yes we did it!! I thought I wouldn't be able to finish, but WE DID IT!!!! Thank you very much for the award and the badge. And congratulations to all of you. We rock! Thanks for the award! I'll place it on the blog. Thans for the award. Goodness gracious you have a lot of mail!!! Congratulations for even attempting to get to all us finishers to give the award, and love zee 'z' pozt! Thanks for the visit and the award! This was a blast! Love the look of your blog, looking forward to reading more! Congrats everyone. It was fun! This calls for a hearty roistering indeed! I promised to tell the truth in all of these a-z posts. Now that it's over I can go back to lying all the time. BTW I am 17 feet tall and a secret millionaire.